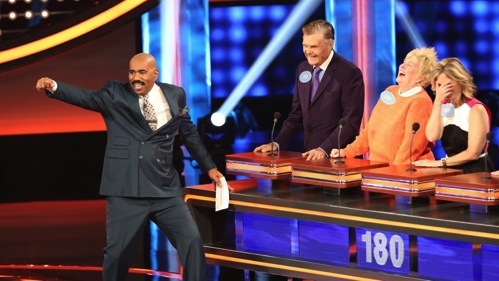 Last summer’s launch of Celebrity Family Feud came up very big in the ratings for ABC. So here come new versions of To Tell the Truth and The $100,000 Pyramid in addition to the returns of Feud and 500 Questions. ABC’s summertime game show palooza starts early on Thursday, May 26th with Season 2 of 500 Questions, hosted by Nightline anchor Dan Harris (Ted Koppel again throws up in his mouth) and produced by reality maestro Mark Burnett (Survivor, Shark Tank, etc.). To Tell the Truth arrives on Tuesday, June 14th, with Anthony Anderson in charge of a celebrity panel that includes Betty White, NeNe Leakes, Jalen Rose and a weekly guest. For the many who don’t remember the original, this is the show where three people all claim to be the same person. But only one is. Host Steve Harvey will add to his riches by again hosting Celebrity Family Feud, which returns on Sunday, June 26th. Harvey also has another big hit of late as the host of NBC’s Little Big Shots while continuing to preside over his daytime talk show. If anything, his famed Miss Universe gaffe has only made him bigger and more marketable. The $100,000 Pyramid also premieres on June 26th. Michael Strahan (more on him later) will be hosting the timeless word association game. No celebrity participants have been announced yet. There also are some new non-game show entries. ABC is more than a little late to this particular game after FX drew virtually universal critical praise for its 10-part The People v. O.J. Simpson: American Crime Story. But O. J.: Made In America is coming anyway -- on Saturday, June 11th. It’s a seven-part documentary series from the producers of ESPN’s acclaimed 30 for 30 sports series. So this could be very good, too. Uncle Buck also is coming -- on Tuesday, June 14th. Mike Epps plays the title character in this sure to be very broad sitcom. CBS offered a quickly canceled Uncle Buck series back in fall 1990, with Kevin Meaney starring. If only they’d wise up and retitle these things Uncle Barky. ***The aforementioned Strahan will be joining ABC’s Good Morning America as a full-time co-anchor in September while also leaving Live with Kelly and Michael, which is syndicated by Disney-ABC Domestic Television. Strahan has co-hosted for the show for the past four seasons, and a search for his replacement will begin in the fall, ABC says in a publicity release. He’ll also continue as a co-host of NFL on Fox, which makes Strahan every bit as busy as -- Steve Harvey. ***Lifetime’s new clarion call is “Welcome to the Fempire.” It’s the network’s way of introducing a new 2016-’17 development slate that will include projects from Selena Gomez, Serena Williams, Janet Jackson and Rhonda Rousey. ***NBC says that Season 2 of its Charles Manson-themed Aquarius will premiere on Thursday, June 16th with a commercial-free two-hour episode. David Duchovny stars as a hard-boiled, Joe Friday-ish detective in Aquarius, with Gethin Anthony as Manson. Season 2 will add Manson “Family” member Charles “Tex” Watson to the mix, with Cameron Deane Stewart playing him.